I have shown photos recently of Playa Hermosa and Playas del Coco, about an hour north of Tamarindo, so I thought I would show a photo of Tamarindo beach for contrast. Something is strange about this photo. There is a woman walking with a purse and wearing a dress on the beach. My guess is that she works in a shop in central Tamarindo and she is walking home at the end of the afternoon. Rather than walking along the main street, which runs along he beach, she has taken off her shoes and walks along the beach. What a pleasant commute to and from work! This is a photo from the north end of Tamarindo beach, which is the area popular with surfers. The south end of Tamarindo beach is protected from the waves by an island and reef, so the surfers gather in this area. We are showing photos of Norway this week on our Viva la Voyage travel photo site. The dive attendant in yesterday's photos was snapping his fingers. That was the clue to what he was doing. He was summoning his dog, who attentively ran to his side and kept him company while waiting for the divers to return from the sea. This week we are showing photos of Norway on our Viva la Voyage travel photo site. If you have not checked out the photos yet this week, come take a look. I am confident that the first photo posted will show more sailboats under sail in one place than you have ever seen before. This photo is a closer view of the dive attendant that I showed a few days ago. He has extra air tanks, a gasoline can for the dive boat, a water cooler and an ice chest. But his attention seems to be diverted to the beach on his left, rather than looking out to the ocean where the divers are. What do you think he is looking at? Perhaps a pretty woman? A food cart? Children playing? The answer will be shown tomorrow, of course. This week we are showing photos of Norway on our Viva la Voyage travel photo site. Here is another view of the town of Playa Hermosa. There are some restaurants, as you can see in this photo. I think someone is burning some trash or excess vegetation up the street on the left. This is a photo of one of the main streets in the town of Playa Hermosa. It is a quiet, Costa Rican beach town. It is much smaller than Tamarindo and does not have the shopping, restaurants and activities of Tamarindo. Yesterday Zakton of Jakarta Photos left a comment saying that he thought that there is a Hermosa Beach in California as well. Indeed there is. It is in Los Angeles, a little south of LAX Airport, north of Palo Verdes and Long Beach, near to Redondo Beach. It is a nice each community. In California they like to give Spanish names to streets and towns, even for places named by Anglos rather than the Spanish. Today is Sunday, so we have new photos posted on our Viva la Voyage travel photo site. This week we are showing photos of Norway, a beautiful country. Because the waves at Playa Hermosa are so gentle, it is a popular place not only for swimming, but also for snorkeling and scuba diving. Here you see a photo of the attendant for a group of scuba divers, sitting on the beach with the extra air tanks. This week we are showing photos of Torres del Paine National Park in Patagonia, near the southern tip of Chile, on our Viva la Voyage travel photo site. Here is another view of the beach at Playa Hermosa, taken from about the same spot as yesterday's photo, but looking up the beach in the opposite direction. There are two towns in Costa Rica named Playa Hermosa, both on the Pacific. Visitors need to be careful if they make reservations to be sure that the hotel or tour operator is located in the same Playa Hermosa that they intend to visit. I am showing photos of the Playa Hermosa in Guanacaste province in northwest Costa Rica. The other Playa Hermosa is in the central Pacific region of Puntarenas. It would be a big problem if someone flew into the airport in Liberia and drove to nearby Playa Hermosa, only to find that the condo or hotel where they have a reservation is in the other Playa Hermosa at least 4 hours away. Here is a beach level view of the beach at Playa Hermosa, which I showed from above during the past few days. This shows the sheltered effect of the bay. It is gentle for swimming and boats can be moored in the bay, but obviously there is no surfing happening on this beach. This is a closer view of the overview of the beach at Playa Hermosa that I showed yesterday. The beach is in a cove that is part of the larger Gulf of Papagayo. It is therefore protected from the ocean waves. Unlike Tamarindo, a popular surfing beach, you do not see surfers in this photo. There are some places for surfing in the area, but it would require a drive or going with a guide. This is a photo looking down at Playa Hermosa from the ridge to the north. Playa Hermosa means beautiful beach in Spanish, and this photo shows why it deserves that name. As this photo shows, the town of Playa Hermosa by the beach is tiny (as I will show in a few a days), with condos sprinkled in the hillsides above the town. I apologize that I took these photos on such a gray day several months ago, but it was a cloudy day in Tamarindo so I decided to take a drive to see some of the beach communities about an hour up the coast. I have shown a few aerial photos of the approach to the international airport in Liberia during the last few days. Here is a photo as the airliner crosses the Costa Rican coast. Below in the foreground is Playas del Coco and the cove and beach just to the north is Playa Hermosa. North of Playa Hermosa is Playa Panama, which is barely visible in this photo. I will start a series tomorrow to show photos of Playa Hermosa. I showed a series of photos of Playas del Coco several months ago. This photo shows how condos have been built up in the hills around these Costa Rican beach towns to take advantage of the views of the ocean. This view from an airliner window during the approach to the Liberia airport shows the ocean in the distance, and flooded fields in the foreground. My guess is that these are rice paddies, as it appears that there are short plants growing up through the water in the foreground, but not in the center, as the water there reflects the clouds smoothly. Update on border dispute with Nicaragua: Several days ago I did a post about a border dispute with Nicaragua. Jack of Hartford Daily Photo asked a very good question and others left comments asking for updates. There is significant news. The International Court of Justice in the Hague has issued a provisional ruling until the Court issues its final decision, which could be months or years. In the meantime, Nicaragua must vacate the island that is claimed by both countries and the only persons allowed on the island will be Costa Rican environmental personnel. Nicaragua may continue to do dredging in the river, however. Costa Rican government officials declared the decision a victory and said that the Court showed that countries such as Costa Rica that have chosen not to have an army may obtain justice and solve disputes peacefully, without armed conflict with neighbors who have armed forces. Nicaragua also claimed that the ruling favored them because they can continue dredging activities in the river, which Costa Rica says is causing environmental damage to the river that is the border. Importantly, both countries say they will abide by the decision. To address Jack's questions, none of the articles that I have read has suggested that there is anything particularly valuable about the island in dispute. Nicaragua has alleged that it is dredging the river for navigational purposes, and Costa Rica has asserted that Nicaragua has caused environmental damage and has invaded Costa Rica by sending its soldiers to the island. I had been away for two weeks in Spain with my family until this weekend, so I had done my previous post in advance before I left, and just caught up with his news that happened last week. We had a delightful dinner with Rob and Mandy of Barcelona Daily Photo while we were in Spain, as they showed and described on their post a week ago Sunday. Today is Sunday, so we have new photos on our Viva la Voyage travel photo site. This week we are showing more of the stunning scenery of Torres del Paine National Park in Patagonia, near the southern tip of Chile. Here is another photo of the scenery on the approach to the Liberia airport. This will give a perspective that the airport is close to the coast because the plane is low as it crosses the coast and heads inland. It is more convenient for tourists that the airport is on the ocean side of Liberia, as that makes the airport even closer to the Pacific beach resorts. Opening up the Liberia Airport to international flights about a dozen years ago is responsible for rapid growth of tourism in northwest Costa Rica. There are about 50 flights a week from the USA. We are showing photos of one of the world's most elegant hotels, Villa d' Este, on the shores of Lake Como, Italy, on our Viva la Voyage travel photo site. This is an aerial view of a river between the Liberia airport and the Pacific, viewed from an airliner on the approach to the airport. This gives me an excuse to talk about a very serious and sad subject regarding a river in Costa Rica. One section of the border between Costa Rica and Nicaragua is a river. The Nicaraguan government has recently done some dredging to change the channel. This has diverted the channel towards Costa Rica, and has created more land on the Nicaraguan side of the river. Costa Rica has filed a claim in an international court, arguing that the border should stay fixed where it was, and not move as the river is diverted. Furthermore, the diversion of the river has caused damage to the environment and wildlife. Nicaragua has sent in troops to the area. This is causing Costa Rica to consider whether it should change its policy of the last 60 years of not having an army. This is very sad. Hopefully the international court will decide this matter peacefully and Nicaragua will respect international law. To the left of the area shown in yesterday's photo is a suspension bridge used by workers to get to the factory or mill. This worker was making a repair to the bridge. I hope he was tied off because it looks like he is standing on the cable or rail on the edge of the bridge. This mill is within walking distance of the main road from Liberia to Santa Cruz, so many workers undoubtedly take the bus and then walk the rest of the way to work, going across this bridge. The factory or mill in this photo was just across the river from the spot where I took the photos I have shown during the past week. This will show you how high the men and oxen had to haul their heavy loads of wet sand. I do not know what type of factory or mill this is, although I suspect that it is a sugar cane mill because of the incinerators with smoke stacks outside. Also, there is a lot of sugar cane grown in this area. One thing that is curious in this photo is that to reach the mill, you have to cross the river, but instead of building a bridge, they laid a road across the river, with a lot of big cement pipes underneath to carry the water. As the height of the river bank shows, there are times that the river water covers the road. So how do you think workers get to the mill with the river is high? As you have guessed, the answer will be shown tomorrow. This photo shows why the men were in the river with their ox cart. They were digging up sand from the river bottom, hauling the wet sand in the ox carts out of the river bed and up the embankment to the area from which I was taking photos, and then dumping the sand. The sand is evidently used for mixing with cement for concrete for construction. I was told that the crew with the oxen get the equivalent of $8 US dollars for each ox cart load of sand. I don't know about you, but it seems like a lot of work (for the oxen as well as the men) for $8. The average income in Costa Rica is about $10,000, which is more than triple the average income in neighboring Nicaragua. The most difficult and low paying jobs in Costa Rica are done by Nicaraguans. Perhaps as much as 20% of the people in Costa Rica are Nicos, many of whom came across the border without going through immigration procedures. When it is time to leave the river, the men splash the oxen to get them to move. That seems like a gentle, refreshing way to get the oxen's attention. In fact, they might think that if they stand there long enough without moving, they will get a shower on all sides, which must feel good on a warm Costa Rican afternoon. The answer to what these men and the oxen were doing in the river will be shown tomorrow. These are not fishermen, but they are workers. This looks like hard work. Their work method reflects that Costa Rica is still a developing country. as in the USA one would never see the work that they are doing performed in this manner. Costa Rica ranks close to 100 among nations in per capita income. It ranks high in education and health care. President Laura Chinchilla has set the national goal of being the first Central American country to be ranked as a developed country, and it is much more prosperous than other Central American countries, with four times the average income of nearby Nicaragua. More tomorrow about what these men were doing and how much income they receive from their labor. Today is Sunday, so we have new photos on our on our Viva la Voyage travel photo site this week. This week we are showing one of the world's most elegant hotels, the Villa d' Este, on the shores of Lake Como, Italy. There is something more going on in the river than an ox cart crossing from one side to another. Here you see a man bending over and doing something. There is something in the ox cart. A bucket. The man has a pole in his hand. Could they be fishermen who are hauling their catch out of the river in an ox cart? That would be better than trying to carry fish out. We are showing the spectacular scenery of Torres del Paine National Park in Patagonia, near the southern tip of Chile on our Viva la Voyage travel photo site this week. In the river photo that I showed yesterday, there was an ox cart in the river, as you can seen in this photo. Ox carts are very traditional in Costa Rica, but most are brightly pained wood cars now used mostly for decoration. This is a working ox cart, made of metal. But what is it doing in the middle of the river? Are they trying to cross the river? This scene of a meandering river about a half hour from Tamarindo is fairly typical of the surrounding countryside. But there is more to this photo than a river. The story of what is going on in this river illustrates that Costa Rica is still a developing country. As regular readers of this website know, I like to string things along, day by day, in serial fashion. Yesterday's sunset photo showed the crashing fury of the waves against San Francisco Point. In the sheltered waters of the southern end of Tamarindo Bay, the gentle wave action as water retreats slowing on the gently sloping beach provides a more subtle and muted palate for reflecting the sunset. 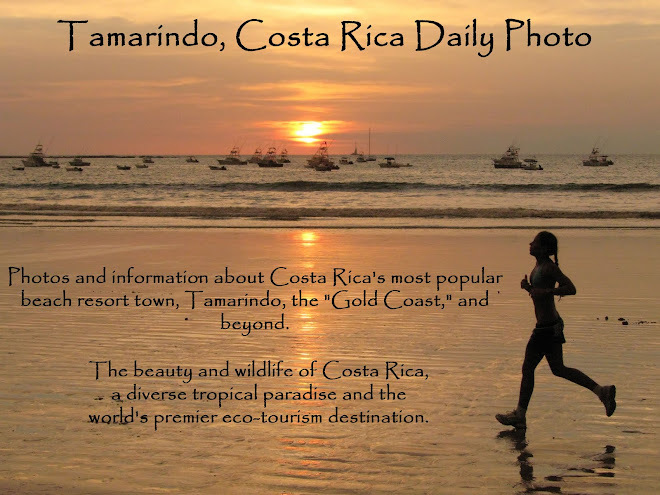 Tomorrow I will begin a short series that will illustrate that despite the modern condo buildings and resorts of Tamarindo, Costa Rica is still a developing country. It has occurred to me that I have not shown a sunset photo in a long time. What is wrong with me? Sunset is the best time of the day in Tamarindo. This photo shows the splash from the waves catching the light of the setting sun. I took this at San Francisco point, which divides Tamarindo Beach from Playa Langosta. Tomorrow I will show a variation that captures a different sunset mood. As I did with the photos of the woman fire twirler, here is a flash photo to show the fire juggler. This couple was not very assertive about soliciting tips. Perhaps the restaurant has told them not to come in and go table to table like the singing cowboys do. Instead, I had to get up from my table and walkout to where they were to give them a tip before they finished their routine and walked on their next stop. After the woman I showed the last two days performed her fire twirling routine, this man juggled clubs on fire, including tossing the burning clubs up with his foot. It is common that cowboy trouboudors walk around from restaurant to restaurant singing for tips in Tamarindo. I guess these fire jugglers are trying the same technique. I like taking night photos using available light, although it is tough to do without a tripod, as this photo shows, as the torches were the only source of light. Today is Sunday, so we have new photos on our Viva la Voyage travel photo site. This week we are showing the spectacular scenery of Torres del Paine National Park in Patagonia, near the southern tip of Chile. Here is another photo of the fire juggler that I showed yesterday. I used the flash for this shot to capture her in sharper focus. I am not sure I quite understand the reason for the leggings under her pleated skirt and the tall boots. In tropical, warm Costa Rica, no wonder she is sweating dressed like that while getting an upper body workout twirling the little balls of fire. While having dinner as La Baula, two people came by to entertain the diners by performing a brief routine of juggling and twirling objects on fire. I took this photo without a flash and the slow shutter speed shows the movement of the fire, although her movement also causes her image to be a little blurred. Obviously entertainment such as this could occur only if the restaurant has outdoor dining to watch this act on the lawn next to the restaurant. I don't think this would work indoors. On a drive north from Tamarindo, the road leads to Brasilito and then Playa Flamingo, and ends at Playa Potrero. This is a photo from Potrero looking back to the south across Flamingo bay. This is a scenic bay that is the best natural harbor in the area. There are fishing and tourist boats in the bay, some homes, condos hotels and restaurants, but not a real town like Tamarindo. There was a proposal a few years ago to develop a large marina, capable of accommodating cruise ships. The losing bidder for the rights to develop the $90 million project won a bid protest case against the local governnment, and before the project could be bid a second time, the recession set in, and the project is stalled. This week we are showing photos of Bellagio and Varenna, Italy, two charming towns on the shores of Lake Como, on our Viva la Voyage travel photo site. The worldwide Daily Photo theme for the first of March is "favorite part of town." My favorite part of Tamarindo is the beach. Now, you might be thinking that I should show the town, not the beach, but this photo shows the center of town. Our condo at the Diria Resort is the tall building above the trees in the center of this photo, and it is in the center of town. This is a wider shot of the same beach scene that I showed yesterday. I like that the beach has so much room, even in the center of the beach. It is not like beaches in the USA where you have to stake out your area and worry about other people crowding around you. We have photos of two charming towns on the shores of Lake Como, Bellagio and Varenna, Italy, on our Viva la Voyage travel photo site.